Keiu Matsuo piloted one of three Japanese midget submarines that attacked Sydney Harbour on May 31, 1942. 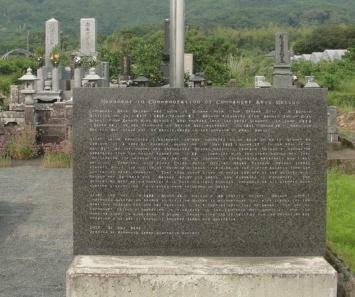 The Japan Australia Society erected a monument in commemoration of him in 2004 in his home prefecture of Kumamoto at the Matsuo family gravesite where Keiu Matsuo's ashes are buried. Commander Keiu Matsuo was born in Mitama-mura (now Yamaga City) in Kamoto District on July 21st, 1917 (Taisho 6). Matsuo graduated from Kamoto Junior High School (now Kamoto High School) and entered the Naval Academy. In June 1939 (Showa 14) he was promoted to Acting Sublieutenant. In 1941 (Showa 16) when the Pacific War broke out he participated in the bombing of Pearl Harbor. After being appointed Lieutenant, he was honoured to be able to go to Sydney as Captain of a special purpose submarine in May 1942 (Showa 17). In the evening of May 31st as the submarines approached Sydney Harbour, Captain Matsuo's submarine separated from the mother submarine I-22 together with two other submarines. They infiltrated the harbour by navigating the channel's complicated geography and tight security. Together with Fleet Chief Petty Officer Masao Tsuzuku, Matsuo fought bravely until the following morning without yielding to the fierce attacks from the Australian naval vessels. They took their lives to evade capture by the Australians. Matsuo was 24 years old. Matsuo after his death was elevated to Commander. The Australian Navy held a funeral with full military honours recognising his bravery with supreme distinction. His ashes were returned to Japan. After the war in 1968 (Showa 43) Matsuo's 83 year old mother Matsue deeply impressed Australian people by visiting Sydney to acknowledge and give thanks for the gracious funeral her son had received. As a form of spiritual exchange, the bow of Commander Matsuo's submarine is displayed in the Canberra War Memorial and its conning tower is displayed in Sydney recognising the chivalry of the two countries and creating a bridge of goodwill between Japan and Australia. The monument inscription mentions that he participated in the bombing of Pearl Harbor. In early November 1941, Keiu Matsuo went with two other Navy officers under false identities on a commercial Japanese liner to take observations of the harbor and its military strength. Upon his return to Japan, he briefed the ten crewmembers of the five midget submarines that would participate in the Pearl Harbor attack, and he went to Hawaii for the attack in submarine I-22, the squadron flagship, which carried one of the five midget submarines . 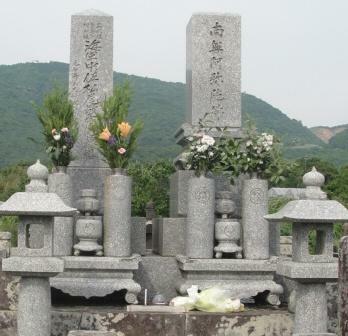 The Matsuo family gravesite, where the Matsuo Monument was erected by the Kumamoto Japan Australia Society, is surrounded by agricultural fields and is located a few hundred meters from the home where Keiu Matsuo was born and grew up. His niece Kazuko Matsuo and her husband still live in the home (as of 2011). Left stone marker says Navy Commander Keiu Matsuo. Right stone marker says Namu Amida Buddha. Navy Commander Keiu Matsuo grew up in the area of Kubaru in Yamaga City. He graduated from the Naval Academy and served in World War II. On May 31, 1942, he made an attack in Sydney Harbour with a special submarine (tokushu senkotei). He died in battle and became a war god. He was 24 years old when he died. The Navy of Australia, although an enemy country, gave him a naval funeral and praised his bravery as a military man. His mother Matsue visited Australia in May 1968 to express her deep appreciation to Australia. 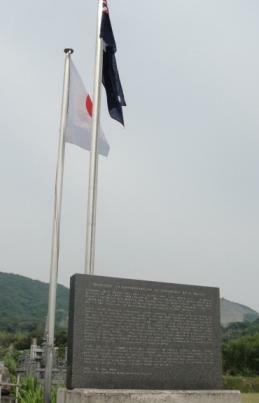 We erect here a monument to praise the distinguished deeds of mother and son, Matsue and Keiu Matsuo, and to serve as a remembrance of friendship and exchange between Japan and Australia. I have been criticised for having accorded these men military honours at their cremation, such honours as we hope may be accorded to our own comrades who have died in enemy hands: but, I ask you, should we not accord full honours to such brave men as these? It must take courage of the very highest order to go out in a thing like that steel coffin. I hope I shall not be a coward when my time comes, but I confess that I wonder whether I would have the courage to take one of these things across Sydney Harbour in peacetime. Theirs was a courage which was not the property or the tradition or the heritage of any one nation: it is the courage shared by brave men of our own countries as well as the enemy, and however horrible war and its results may be, it is a courage which is recognised and universally admired. These men were patriots of the highest order. How many of us are prepared to make one thousandth of the sacrifice these men made? The memorial post's mention that the Navy of Australia "praised his bravery as a military man" primarily refers to the above speech by Rear Admiral Muirhead-Gould. Another monument honoring Keiu Matsuo stands at Kikuchi Jinja in nearby Kikuchi City, Kumamoto Prefecture. In 2007, a half-hour animation movie entitled Matsuo Keiu to sono haha (Keiu Matsuo and his mother) was released. It is part of a DVD entitled Heiwa e no ukei (Pledge to peace), which also includes the story entitled Yamaga tourou (Yamaga lanterns). Burlingame, Burl. 1992. Advance Force Pearl Harbor. Annapolis: Naval Institute Press. Grose, Peter. 2007. A Very Rude Awakening. Sydney: Allen & Unwin.